Designed by architect Paul Buchanan, the house sits on over 2 acres of wooded land in Newburgh, Indiana, overlooking the Ohio River. The warm wide-planked wood floors keep the rooms from looking too chilly, though. There are some quirky and unexpected touches throughout the house, for sure, which keeps things interesting. The house has 4 bedrooms and 4 baths. The kitchen looks a little small for a house this size, so I have a feeling there’s more to it we’re not seeing. The house sits on the banks of the Ohio River. It’s listed with John Pickens of Berkshire Hathaway for $1.399 million. Check the listing for more photos and information. 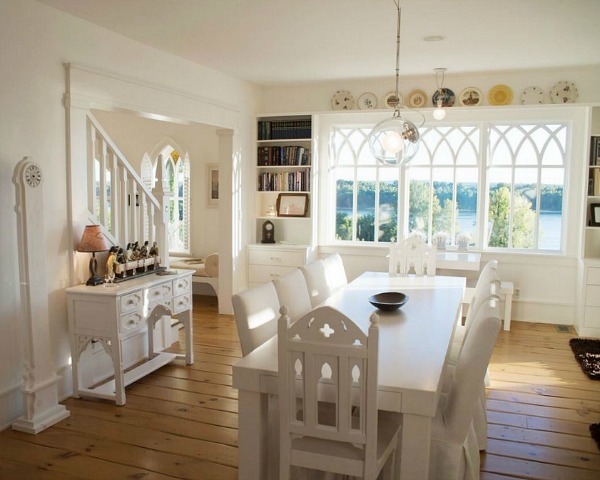 I love all the details of this home… those arches are wonderful! However for me, all that lovely detail and gingerbread trim is screaming for some color! Right now the house seems cool and aloof and I think it would look full of life with color added. I would like to see a little boho-chic décor in this house. The swings would go outside. I’m wondering also about the size of the kitchen. Definitely would introduce color. But it is a lovely and unique home. The cheeriest Gothic I’ve ever seen! It would be tempting to add pops of color but it’s so serene as is. It really does keep the focus on the details and the view, doesn’t it? Ooh, that sounds pretty, Susan! Thanks Julia, it is very pretty. Small but pretty. I sent you a picture a few months ago and you said you loved the tile back splash and it made you want to redo your kitchen! I’m sure your kitchen is as lovely as the rest of your home. My designer suggested hot pink as a accent color too. When I tire of the orange and yellow I’ll do that. Go for it! It’s a pain living through it but so worth it in the end. This house is beautiful as is. It makes such a statement. The owner is a customer of mine. She is a lovely lady. All of those who walk our trail along the Banks of the Ohio river in Newburgh get a glance of the back of the house with the beautiful church windows. It draws your eyes up it the hill where it is located. Personal taste of color would be the buyers decision. That is a completely awesome house. I really love everything about it. I love the architecture and the vibe and (most of) their furnishings, especially on the main level. I love the stairs and the landings and heavenly wall textures and the windows, oh my stars those windows!!! The setting is to die for. I even really enjoyed their absolute commitment to white, though I could never choose that for myself. I could live happily in that bathroom. The only thing that didn’t rock my world was some of the light fixtures and those strange little chairs in the bedrooms. What are those for, exactly? I tried to think how I would add color to the space, but it’s hard. Pops alone would be too jarring. There would have to be some coherent theme to the color. Maybe only personal items in color? I have temporarily settled on soothing flat wall colors and everything else white (with maybe a fun wallpaper in a hall or dining area). But again, that would never work with my own things because I love color. Even my Viking stove is bright red! Thanks, Julia, for giving us a really fun, original house to think about all day! I see your point, Wendy. It might be pretty to just add more wood furniture (not have everything painted white) to soften and warm things up. Beautiful!!! I agree about too much white though. Instead of pops of color, I’d paint the walls in shades of dusky, lightish blue and green. Add some worn oriental rugs and some oil paintings, keep it casual and lived-in…. Definitely move the swings outside and get rid of the back to back chair collection (?). 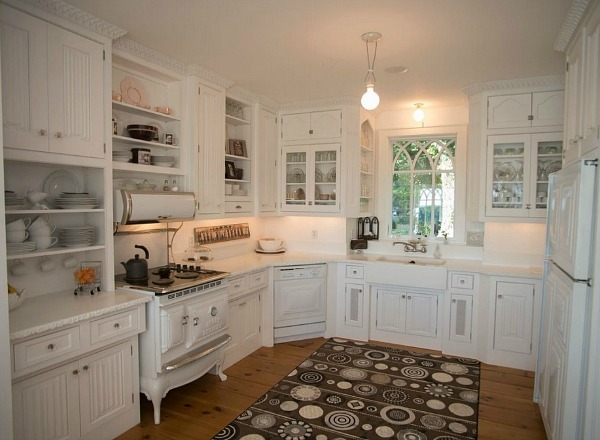 The kitchen looks very nice but I wonder if there’s a breakfast nook or something attached. The setting is pretty idyllic. I wonder if you can swim in that river? I adore that mailbox, and the arched windows and doors are lovely. I agree with adding a little colour, but was thinking more of ‘sea-glass’ style colours – probably on the walls – and more wooden furniture. I’d want to keep the overall feeling of light. I hadn’t seen that! How fun — thanks, Elizabeth! It’s always good to see new construction which pays respectful homage to the past; the architect clearly understands the 19th century Gothic Revival. If this were an historic house, the white would bother me. As a new house, it seems appropriate. Personally I would need more color, but I have to admit it looks good as it is. There is sufficient detail and surface variety to temper the whiteness. The tiny pieces of stained glass at the top of some of the lancet windows are the sole concession to color and very effective! Wow! I think this would have been my fantasy house about thirty years ago. (My tastes and lifestyle have changed a bit over the years.) I love those windows. The center section reminds me of the Carpenter Gothic cottages in Martha’s Vineyard. I think I would add a bit of contrast inside with more wood tones in the furniture like the pine floors and some natural organic elements to warm it up. And if it were mine I’d add some watery blues in my bedroom. 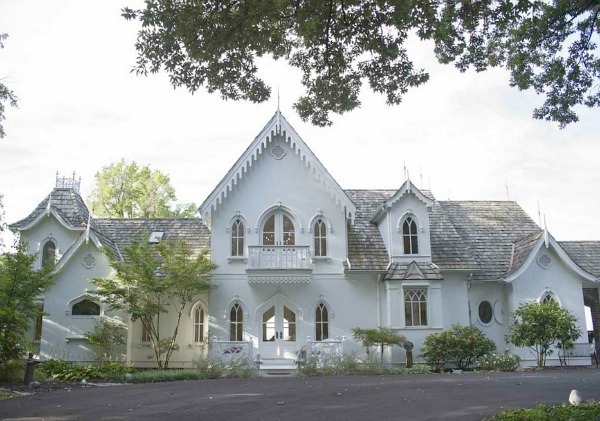 Lovely revival of Gothic Revival architecture. Yep, I could totally live in that house for the rest of my life. Love the details, quirks, white, all of it. It’s gorgeous! Want !! ..but does need some colour! I love the wood floors. :-X Everybody knows the famous Grant Wood painting titled American Gothic, right? It’s the farmer + his wife standing in front of — what else? 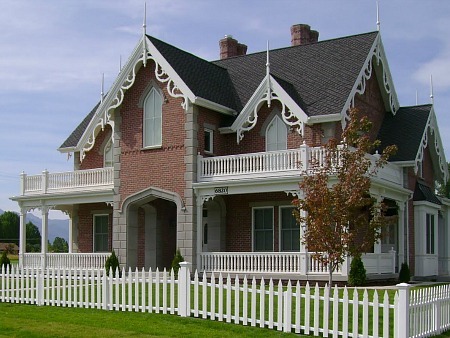 — an American Gothic farmhouse. It’s in the Art Institute of Chicago. See you there! There’s no question that this is beautiful. I think, like many other new homes, this just feels too new to me. If they were going for a traditional look, wouldn’t antique furniture, at least a few pieces, add a sense of history? Patina is what this place needs, in my opinion. The architecture is incredible and so is the view. Not my style or for me, but it is lovely, serene and unique. Love love love this house! would add a bit of color, regular furniture, not all white. the kitchen is to die for, would love to have it just as it is. Sigh. Love the house but too much white. Needs more texture and other neutrals to give more depth. A splash of color here and ther would not hurt . Liked the house, not crazy about the inside. Yes too much white but the furniture is quirky, art deco sofas mixed with church pews in the front entrance? Or is that a living room? Hard to tell. Looks like there’s no place comfortable to sit. The bathroom looks like it’s the shape of a doily, hard to navigate. I like the idea of this house but I’m not a fan of the inside. I always wonder when I see an all-white room what it would look like after I’ve strewn my not-white jacket, bag, notebooks, etc. all over the surfaces at the end of a day. But I love the touches in this house–those windows, those swings! I might even adopt an all-white wardrobe and accoutrement just to experience that. I am very pleased you chose to share this truly beautiful home. It is a wonderful property both inside and out. Although the pictures show some of the detail, the only way to fully enjoy and appreciate it is to tour it. The setting, view , unbelievable quality and attention to detail are the best. Oh, and the white….very peaceful and serene.